I have one question for all of you living in the United States. How do you not eat rice with every meal? What is wrong with you? The thought of not eating rice all day blows my mind. I love it. I must have it. My body craves it. I have rice with every meal. Sometimes it’s fried and sometimes it’s brown, but most of the time it’s white rice. It has no taste, but it’s delicious … like zucchini. My return to the states in April of 2013 is becoming a nightmare knowing I probably won’t be eating rice every day. I don’t know how my body is going to handle it. When I came here in January, my body needed some time to adjust to eating so much rice as well as other assorted strange foods. Now I know I’m going to need to adjust when I start stuffing bratwurst, bread and 2% milk back into me. When the Thais ask if you’ve eaten – which is much too often – they don’t ask, “Have you eaten yet?” Instead, they ask, “Have you eaten rice yet?” (gin kao leeo ru yang). To not eat rice would be like not eating corn in Iowa or not drinking beer in Wisconsin. You’re surrounded by it; what else are you going to eat? I have a rice cooker. I put a cup of rice and water in the bowl, plug it in, push the “cook” button and in about 20 minutes I have a plate of kao arroy (delicious rice). 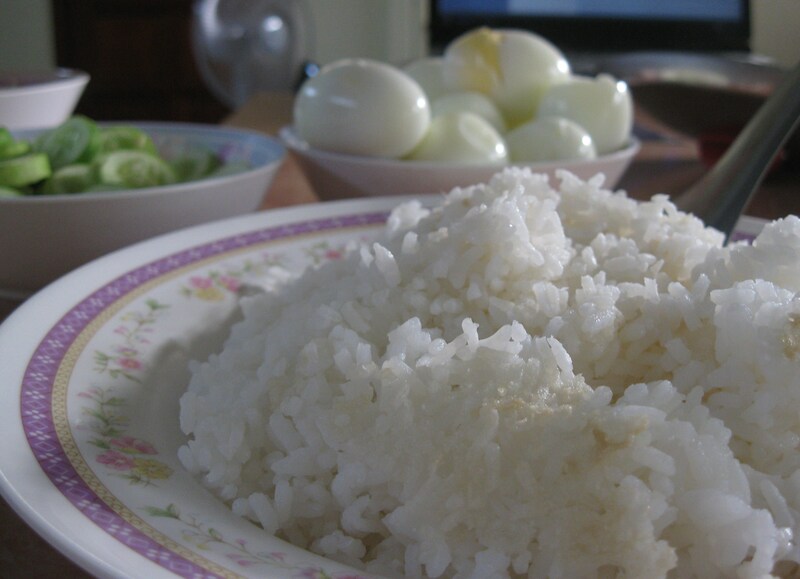 For breakfast I’ll eat my rice with a few hard-boiled eggs and some sliced cucumbers. For dinner I tend to fry some eggplant and garlic to accompany my rice. When I’m hungry, I dream of rice. I don’t dream of pancakes, bacon, biscuits, ham, bratwurst or Caesar salad because they’re not options. Well, I guess I do dream of them, but I dream of them the same way I dream of coffee shops in Paris. They’re attainable, but not right now. This entry was posted in Peace Corps and tagged food, peace corps, rice, thailand by Jeff Jackson. Bookmark the permalink. they have lots of hard boiled eggs and cucumbers–no rice ? What’s sad is that the food in the picture is actually making me hungry. It…oh god…looks good.